When Thomas Schmitz, the O4P California Coordinator and US for Palin writer learned I was going to Paris to celebrate my 15th Wedding Anniversary, he asked that I take an O4P Palm card with me and photograph myself holding it to build a dossier of Sarah images in foreign countries. It would only take a few minutes. I enthusiastically agreed. Over these past three years, I’ve learned that many things with Gov. Palin are not coincidental. They are Providential. As I printed out my Eiffel Tower ticket prior to the trip, the location for the shoot jumped out at me. On the ticket in all capital letters, was the word “SOMMET.” It doesn’t take a genius to figure out that it is French for “Summit”. Some colleagues have complained that I have a tendency to put former Alaska Governor Sarah Palin on a pedestal. Now, I was going to symbolically put her at the Summit of the tallest man-made pedestal in Europe. Putting Sarah on a pedestal? I proudly say: Guilty as charged! After our ascent and with a flute of Eiffel Tower champagne in each of us, I begged my wife’s pardon and secured it. I had to pick the place to do the shoot. I took a few shots to the west, but they came out poorly. Then, I went to the Northwest. Let’s call it 340 on the compass, as I like to say when I’m in New York. Then, I noticed something my wife and I had just descended from the summit of just about an hour prior: the Arc de Triomphe…Providential. Summit. Triumph. Palin. …Just prior to my trip to Newark Airport, I informed my writers about the failure of at least two GOP candidates to gather enough signatures to qualify to appear on the ballots of the Virginia primary. From Paris, I would learn that all the candidates save for Mitt Romney and Ron Paul failed to qualify. I’ll leave it to the readers to decide whether this circumstance is a result of GOP establishment chicanery to benefit Romney, gross incompetence on the part of the campaigns that failed to make the Virginia ballot, or something else. Whatever the root cause, the outcome is an absolute and unmitigated disgrace. I noted with some interest how the mainstream and conservative media seemed to fluff over this rather significant story, indicating a desire to quickly bury it. Of course, if Gov. Palin were a candidate and this circumstance befell her, we would have been treated to a deluge of articles all the way through and past Election Day on how she was “un-electable.” She would have been the lightning rod and all the other candidates would have gotten a free pass. Now, nearly three months later, we can see the genius behind Gov. Palin’s decision. You see, all these candidates have been and continue to be vetted before the electorate, something which would not have happened if she were currently on the ticket. The clock is doing its work with every second that ticks by. Passage of time is proving that Gov. Palin’s decision does not change the simple fact that she is the best person and most qualified for the job of POTUS. She has the accomplishments; the leadership skills; the executive, command, and financial administration experience; she took on corruption in both parties in every position she held. Yes as a man, I say it’s time for a woman to take the helm – and not just any woman, but a woman who is both ordinary and extraordinary. This is why I find it absolutely ridiculous that anyone speaks of giving Gov. Palin a second-fiddle position such as Vice President or a cabinet position. Gov. Palin is a Transformational Leader – the type who is brought in to fix broken organizations. Her place is not second. It’s first. She is to be the dominant one in any relationship. That’s why she is called a leader. Period. Compared to Gov. Palin, the field of declared candidates is Lés Miserables. When your accomplishments are of the size, scale, scope, and frequency of Gov. 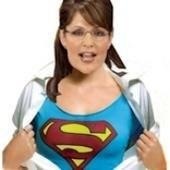 Palin’s, yes you probably are a superhero minus the silly cape. Hero worship? Guilty as charged and proud of it. Gov. Palin’s only proper place is at Au Sommet and her only proper outcome is Triomphe. Failure is not an option. One of the many things I admire about Gov. Palin: she does something right or she does not do it all. Reaching Au Sommet could mean she ultimately runs for POTUS in this cycle of back-loaded primaries. It could mean continuing what she is doing as a private citizen rooting out crony capitalism and endorsing down-tickets ala 2010. It could mean both. It could mean something else. How Gov. 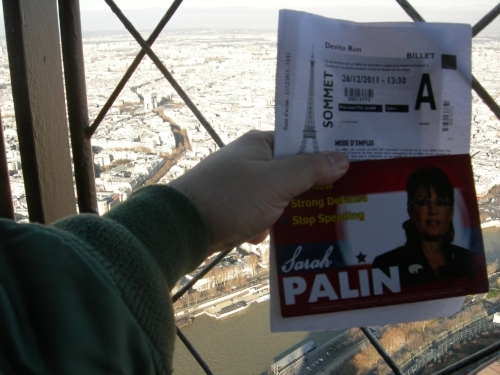 Palin reaches Au Sommet does not matter to me – as long as she reaches it – and Triumphs. As we bid au revoir to 2011, here is the 2011 Master List of Governor Palin’s Accomplishments. The 2012 Master List of Governor Palin’s Accomplishments is now open. This entry was posted on December 31, 2011 at 9:28 PM	and is filed under Uncategorized. You can follow any responses to this entry through the RSS 2.0 feed. You can leave a response, or trackback from your own site. Une Bonne Annee a vous, Ron – GREAT report from the City of Lights!! Bien fait! Vous avez l’esprit du jou – Bonne Chance, Mme Pailn! !